This Call Will Be Monitored: WHY? I do not know why they say they are taping for quality assurance. There is no assurance and the reason they are taping is to make sure that they can play back your words but you can’t play back theirs. I find it really uncomfortable knowing that when I want to have a conversation with the phone company, a charge card company or even a doctor’s office they find the need to tape what you are saying to them. Well, yesterday one young man found out that his words were taped and I hope that when replayed his professional skills were either under higher scrutiny or maybe he was encouraged to change careers. Whenever you call the phone company and you want to discuss your bill you find yourself trying to understand a convoluted bill that has more charges than the basic plan that are paying for. Between the surcharges and the triple taxes that are incurred for everything from the number of lines you have to the federal, city, state and other taxes, it would be cheaper to pay that than the phone bill. This month my bill was larger than the national debt, or so it appeared to be. When you have both your cell and home phone on one bill it can become confusing. The charges are all mixed together and it looks like an invoice for tests in a doctor’s office and more rather than a simple phone bill. I sometimes think that it would be easier to say you owe this for one phone and this for the other one and all of the taxes come to this. Of course if they made a mistake or overcharged you then you get an adjustment or a credit on the next bill or so you are supposed to get one on the next bill but not before you pay the ridiculous amount on the present one. Why not just take the amount off of that bill and not have to worry about the next one. I guess they feel we might forget about the credits, but most people don’t. All the while you hear this awful beep in your ear because they are taping your words. I mentioned that to the rep today and she said they do it to make sure they are giving us, the consumer good service. I tend to think it is more like one more way to infringe on our freedom of speech and the right to say whatever needs to be said without having to worry about some ridiculous tape. Well, if that is not bad enough my doctor’s office now tapes you when you make your appointment because they have an appointment line. You no longer get the office but you get some person in another state you does not know you or the doctors in the office you are going to and trying to get an appointment is nearly impossible. Now, if you are really sick and need to see the doctor it would be wise not to bother with these incompetent people. When I tried to make an appointment with my doctor the voice on the phone said he would send the doctor a message and ask if he could see me or call me back. He never did. Why? He never received the message. I know this to be true because this doctor calls back in less than 2 minutes whenever you need him or one of his associates. It took him 7 hours to return my call. The only reason I did get him was because I called the answering service and they finally got him. I did tell him their new system was awful or worse and he said he knew. The next day I felt worse even though I was on an antibiotic for my problem. However, I really needed to see the doctor and to figure out a way to bypass the ridiculous appointment line. Well, I decided not to bother and just show up in his office. Smart girl. That did get me to see him and get what I needed. But, if I did not have the guts to do that I would still be suffering. So much for appointment lines and for voicemails when you want to call a doctor and they put you on hold. It is even worse when you call 911 or a doctor’s emergency line and you have to wait 10 minutes until they answer. Whatever happened to real people who answer their phones? Whatever happened to doctor’s that have real people answer without a voice telling you to wait? Whatever happened to having conversation with a company of any kind and saying, DO NOT TAPE THIS! These are my gripes for today. I am sure I will have more. This story is for all those people that complain about what they should have done but did not! I often listen to people in my family and some of my friends complain about getting their bills paid, shopping done, or cleaning their houses. They even complain about the enormous amount of homework their kids get and how they are so cramped for time and have so much to do that they don’t know how they will or can fit it all in. None of these people work. All of their children go to school full time during the day leaving this overworked person to go and do some personal clothing shopping, get manicure and pedicure and of course a facial. There is nothing wrong with this but don’t complain when your food budget is depleted and your mortgage payment is late because you used those funds to buy the new Guess Jeans or Fendi bag that you had to have and needed. Don’t these people work but their spouses not only provide the funds for their bills to be paid and do not ever really become aware of their financial problems until foreclosure comes on the scene. There is nothing wrong with doing things for yourself or buying something to make you feel better or even that weekly manicure. However, I coudda paid that bill but I thought it was due in 2 weeks not last week and so what if I am late. I shoudda paid the mortgage but Nordstrom’s and Sachs were having sales on coats and their new line of bags, how could I resist. My daughter needed new Uggs and my son had to have a new bike. I cannot let them not have what the other kids do. How can I hold my face up in my complex if my children do not have what every other child has? So sad, but true. People that put off doing the important things like paying bills, going to the doctor to make sure you are healthy, dealing with their kids homework first and making sure that all tests are studied for and projects are properly done, are living in a world of using one plastic card to bail them out of another one and ignoring what is really important: their kids and their life. No child needs to have every name brand anything. No child needs to have every toy in the world or every video game or a high-end computer. I grew up in the South Bronx and I was taught from an early age that school was my job and only job and my payment was good grades that I got for studying and wanting to succeed. My parents were not rich but I never thought that I was deprived nor did I ever expect them to buy me something because I had to have it some kids expect. I never heard my mom or dad say I shudda done that or cudda done this differently or I shudda paid the rent on time instead of using the money to buy a new leather jacket. If something had to be done, it was done and the rest came later. My mom insisted that I get A’s on all of my tests and of course, that put a lot of pressure on me. I wanted good grades and got the A’s but I would never say to my parents I gonna study for the test later or shudda studied harder-I knew that if the teacher said there was a test in one week to get started the day I found out. I hear kids today and parents tell their children that homework given on the weekend can wait until Sunday night. They can go and have fun and sometimes these kids actually do their work or they are too tired and ask their parents to write a note to excuse them. Fridays meant do your homework when you get home from school and you have the rest of the weekend to have fun with your friends and family. This worked for me and for my sister. My niece, Jamie is a clone of my mom and I think that is why her two daughters are a students. Dani Nic studies and gets A’s and no one has to tell her to get started-she just does it because she loves doing well in school. Guess what! She is not even paid for getting good grades like those that other kids do. Kati Rose her little sister is doing well in first grade and is proud of herself for her accomplishments. I never was paid for getting A’s or I would be very rich today. Cudda Shudda Wudda done it differently- if you think before you do you might not have to say cudda, shudda wudda? Do not complain about being behind in your bills if you forget to pay them. Do not complain about your children if they do not do their homework if you are not on top of it and know what they are supposed to do. Do not complain that you are too busy to help them study for a test because you need to go shopping with your friends or out with the girls and you are leaving them with teenage babysitter. Do not put off longer what you have already put off long enough. I’m still here: Hear My voice: I Know who you are? Why is it now that you do not know that I am still here? Are you afraid you catch my illness and you will understand it too? That you need to visit before it is to late for me. Why is it that people shy away from those that are ill? Do you really think that you can catch this illness? What you did catch is not the illness it is fear? The fear of getting older and this happening to you. The fear of having to deal with this disease and you are too afraid that when you look at me you might be seeing yourself in the future. MY NAME IS RUTH SWERDLOFF: AND I AM STILL HERE! 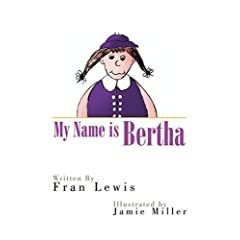 I recently interviewed Fran Lewis, author of the tween My Name is Bertha and Bertha Speaks Out. Fran is currently working on the third book in the series—Bertha Fights Back. Freedom of expression is important, and after retiring from teaching, I realized that there were many new things I could learn to do. I love writing because it allows me to express my true feelings about any subject I choose. Writing is an art. I have always loved writing poems, short stories, and reviewing books or short stories (that my friends would write, that they wanted an honest opinion about). Writing children’s stories is something that I am new at and hope to continue doing. So far, you have written two books and are on your third. This has become a trilogy, possibly a series. What is it about your main character, Bertha, that causes you to keep writing? The main character, Bertha, is really me. Bertha is smart, and she has her own unique voice and personality. She is overweight, as I was as a child, and is often the brunt of jokes, ridicule, and more. Her sister is always prettier, more agile, and able to do sporting activities like dancing and ice-skating. Bertha is still a total klutz, but she’s a klutz with a great sense of humor. Bertha’s father won’t let her play any sports that requires running. She’s allowed to play punch ball, but only on the condition that someone run for her. Bertha goes through many of the things you endured as an overweight child—how has writing about them helped you? In both of my books, Bertha learns to deal with her weight issues, mean teachers that treat her unfairly, and the persistent feeling that she is hiding in her sister’s shadow. In real life, my sister and I were always best friends, and I guess I never expressed how I really felt about being the outcast and the overweight, not so cute sister. I never realized how much I was affected by what I went through as a child and by what adults were doing to me (and others who were overweight) until I wrote these books. You went from heavy to skinny in a few months after years of fad diets and mantras. What was it that finally caused you to start losing the weight? I lost the weight when my doctor called me one morning and told me my cholesterol numbers were off the charts, and that I was eating all of the wrong foods. I realized that my Dad died because he was overweight and had diabetes and more. My mom had a stroke and now has Alzheimer’s disease. I did not want to have any health factors that would cause me to have any serious problems in my future if I could fix them by dieting. I never went on a fad diet, but I did try the heart healthy one and modified it with my own plan. I lost over 75 pounds in three years and will never gain them back again. I walk every day, and I never eat eggs, fried food, butter or red meat. I eat lots of fresh fruit, and I love to snack on grapefruit whenever I get great white or pink ones. I never went on a real diet, and I think that is why I lost the weight. I enjoy food that is good for me, and I have never felt better in my life. I would be happy to share my plan with anyone who wants to try it. Have you had many young girls contact you about their own embarrassment of weighing too much? What kinds of advice do you give them, besides, of course, telling them to buy your book! Do not let others make fun of you. Feel comfortable with the way you are, even with your extra weight; when you are ready and want to lose the weight, you will. I always explain to girls and adults that losing weight is hard and does not happen overnight. It can really be discouraging at first. When I finally realized that I needed to lose the weight or I’d have other problems, it took me 6 months to lose 3 pounds. My dad was overweight, and I guess I always took after him. I have never hurt or insulted anyone, ever, for the way they look or dress. I have gone into stores and been made to feel that I did not belong there because of my weight. I was told in one store that a plus-size store was just across the way and maybe I should shop there. I will not repeat what I told the salesperson. Let’s just say she was encouraged to work elsewhere. To this day, I will not shop in many of the stores where the sales people were rude to me. It is true that you are treated differently in many places because of how you look or whether you can wear particular styles or not. That is sad. I think that buying my book would help all kids understand what someone with a weight problem goes through. I welcome e-mails from girls and adults—I love to help them and tell them how I did it, and possibly give them other resources to help them start their own journey. What have you found to be the best selling method for your book? The best method of selling my book is a hard question. Wherever I go, I manage to tell people about my books. I am on so many sites and have been the featured author on many. I’ve even had an interview on live radio, but no matter now many sites a writer is on, if someone is not looking for that genre, it will not be sold. I could use some help with that. I have blogs, websites, and e-mail addresses. I have five star reviews on many sites, and my books were just reviewed by Online Stories Magazine by Wayne Walker for the July issue. I will take suggestions for this question. Your heart is that heavy girls will be helped through their pain in the crucial, formative years of puberty. Obviously, you have a lot of compassion for those who are hurting. Are there other areas of suffering in others’ lives that you would love to help ease? My mom has Alzheimer’s, and it has had a devastating impact on my life and my family’s life. She is in the last stages of the disease and is at home with split-shift home health aides. It is hard for me, because I have to monitor her care on a daily basis as well as give her the medications she needs twice a day. I am writing a book about how she dealt with the illness when she first learned she had it, and how she is now. The book will include research and information about the disease, websites to find more support, as well as original poems and stories that I and other members of my family wrote. There will be a dedication section and a good memories section. The dedication page will be for short sentences or paragraphs dedicated to anyone who wants to wish my mom well, and the good memories section will have post by relatives whose family members have, or had, the illness. AWESOME INTERVIEW – IT IS SO GREAT THAT YOU WANT TO HELP SO MANY CHILDREN OVERCOME THEIR FEAR OF BEING DIFFERENT. IT’S NICE TO SEE SOMEONE ACCOMPLISH WHAT YOU DID AGAINST ALL THE OBSTACLES THAT YOU FACED. THANKS FOR SHARING. I can’t wait to buy your books. It is great that you want to help so many children overcome their fear of being different. You should be proud of what you’ve accomplished. Sally: Author Sally Hanan and Fran Lewis discuss Her newest release: “Joy In a Box”. What was the reasoning behind the title “Joy In a Box” and how does the title of your book intertwine all of the stories within the collection? In the title story Joy in a box, you began by writing- “I stepped inside as he was hanging the lost painting-it was somehow a comforting place to be……. What created this feeling of comfort and warmth in the character drawing her and encouraging her to appear transfixed by each painting and the art work yet wanting to form her own conclusions about them and not want to hear what the creator of the paintings was trying to say? What motivated you to write this story and what was the reason behind creating this woman’s character? Why did you use this story as the title story in the book? In Gift-a Friend-A Foe- you can tell from the opening sentence that the character is nervous and upset about something from her movements and actions. The way you describe her hands and body you can see she is tense and needs to calm down. What is the true meaning behind the title, which does fit the story? How does the reader find out the motivation behind the character’s performance and actions in the courtroom? What is the underlying motivation that drives her to do what she does and how do you let the reader know she has more planned? Prosperity: Why did you title this story Prosperity and what link does it have to the couple huddled together on the ship and described in the opening paragraph of the story? Roses are Red; “Walter’s bulbous fingers prodded out each letter with care—you can tell that he is older and that he is having trouble typing this special message- yet he does not give up- Why was he going to such painstaking care and lengths to write this card and make sure that it was perfect? What was his relationship to the recipient of the card? Why did you choose this particular setting for the story? The Star of Troy: Megan opened a package with an odd shape-inside was a Christmas tree star sent by her ex-husband, Ryan. Why did Ryan really send this star to her and want to learn her true feelings for him? What did he think he would learn about her by putting a spy camera inside of he star to hear her words and see her reaction to the package? What does her really learn about her true spirit and feelings for him? What does the reader learn about him and what about him changes? Do you think her feelings about him would change if she saw his reaction to her words? Finally- each story brings about characters that need some vehicle or way to bring them hope-salvation or joy in their future and in their lives. How do all of these stories connect to show this underlying theme? In the last story about the little girl who starts out blind- what does the line “Because of your faith-it will happen mean in relation to her, the outcome of he story and all of the stories in the book? Are you going to write more books and what motivated you to write these stories and what will be the next book be stories or a novel?